Did you know that Harry Potter, Hermione Granger, and Ron Weasley, all eventually got their own Chocolate Frog cards following the events of the book series? They’re now on the same level as the greats: Merlin, Agrippa, even Dumbledore himself! But which of the “Golden Trio” would go on to say that the card was his greatest achievement? Why Ron Weasley, of course! With this costume, your burgeoning little wizard can be the funniest, hungriest, and most outstandingly loyal best friend that the Boy Who Lived could ever ask for. And of course, where would we Muggle fans be if Ron hadn’t been there to beat the Giant Chess set protecting the Sorcerer's Stone? Or if he hadn’t saved Harry from being drowned by the locket horcrux? We’d all be in a funk, that’s for sure. We think Ron Weasley never gets enough credit, so we urge your little one to emulate his humble heroism this year. What better role model can you ask for than a hero who, despite saving his best friend’s life multiple times and stepping into adventure from day one of his time at Hogwarts and helping save the entire wizarding world as we know it, simply enjoys the mild acclaim of his Chocolate Frog card? 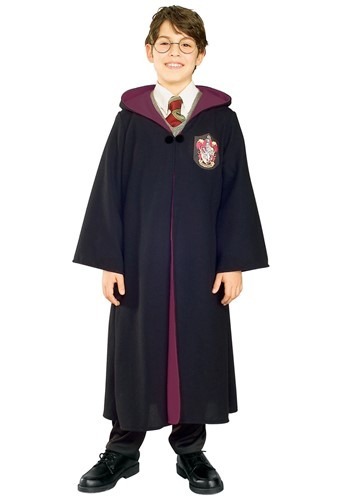 If nothing else, when your little one wears this Child Deluxe Ron Weasley Costume, you’ll be reminded that, like its namesake, your tyke comes from one of the wizarding world’s most popular families...yours! At its heart, the boys’ friendship only materialized because Ron was the first person to be nice to Harry, and surely, that sort of kindness is something you and your family imbue your child with everyday. The world needs more Ron Weasleys!